The term stitching refers to the merging of the same satellite data stream, recorded at different ground stations, into a single stream of data. The merging is done by comparing the individual station data streams line by line, and selecting the highest quality record and inserting it into the output. The Australian National Ground Segment Technical Team (ANGSTT) works to consolidate data feeds from from it's ground stations to optimise data quality and consistency. A rolling archive of available stitched and site specific data assets is now available. The exploitation and elimination of the overlap between reception stations results in a longer and higher quality data set, but reduced in total volume relative to the sum of the inputs. The details of the comparison vary on a per-spacecraft basis because of differences in the way the direct broadcast streams are organised. The image below shows an example for the AVHRR instrument on NOAA-15 with individual receptions from Darwin (DAR), Townsville (CFQ), Perth (PTH) and Hobart (HBT) from a single orbit. In the right hand panel is the stitched output. Notice that virtually all the missed lines from the individual station records have been replaced in the output pass (with the exception of the northernmost Darwin data, which is unique). The data shown is from the reflectance channels; the dark region in the south west is the part of the Earth where the sun has not yet risen. 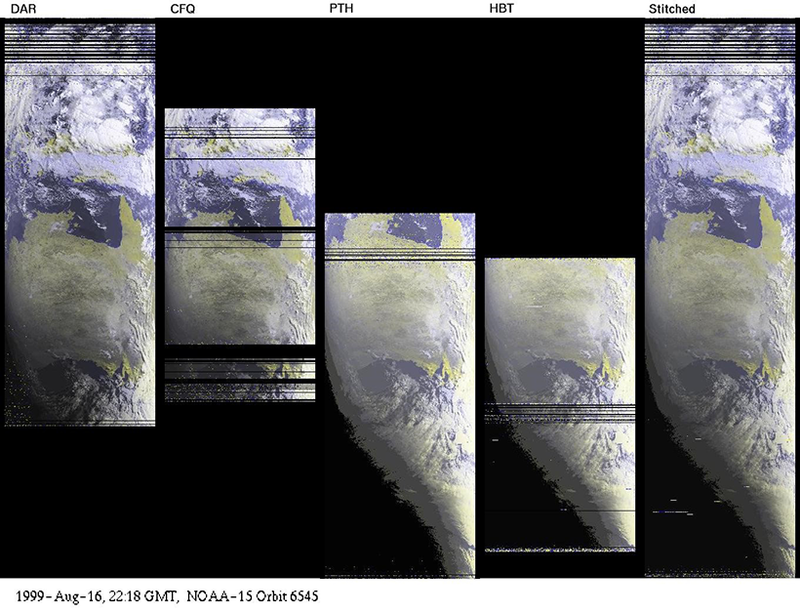 The image above shows an example for the AVHRR instrument on NOAA-15 with individual receptions from Darwin (DAR), Townsville (CFQ), Perth (PTH) and Hobart (HBT) from a single orbit.